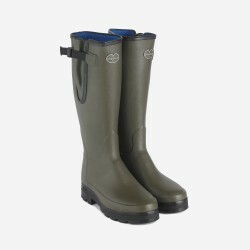 The Le Chameau Vierzonord is as comfortable in all weathers as they are on your feet. It's the wellington boot of choice for everyday country life. 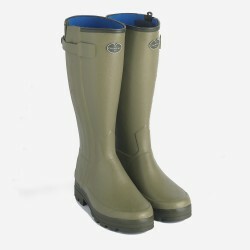 The Vierzonord is famous for being the first rubber boots with an adjustable, waterproof gusset. 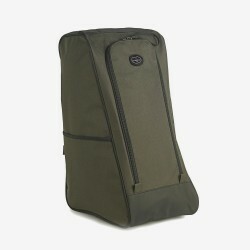 It also boasts an insulating neoprene lining which will keep you warm and comfortable all day long. This boot features a tightening strap and snap-fastening button which helps to ensure a perfect fit around the calf while the shock absorbing anti-fatigue dual-density grip outsole resists abrasion and is suitable for all terrains. The Vierzonord features a dual-density Grip sole which absorbs shock. The under-arch support helps to reduce fatigue while keeping you surefooted on uneven, slippery or soft ground. Le Chameau's signature adjustable waterproof gusset with a tightening strap and snap-fastening buckle for secure fit is featured on this boot. They are handcrafted from natural rubber using an aluminium last for a comfortable fit around the leg. The fast drying neoprene lining provides an excellent cushion while keeping your feet dry and warm. They are built with a combination of natural rubber and neoprene which allows the boot to flex naturally for ultimate ease of movement. The boots have been handcrafted since 1965. The Vierzon is an iconic Le Chameau product which is famous in the field and country as the first rubber boot with an adjustable, waterproof gusset. Lined with 3mm of neoprene, this best selling boot provides exceptional insulation against the cold an superior comfort when walking. Originally used to make diving suits, neoprene has excellent insulating properties and prevents the wearer's body heat from dissipating. The Le CHameua Vierzonord is comfort rated to temperatures as low as -15°C.